Rebecca Gouldson’s first solo show concentrates on the images and objects of historic industry, with beauty and intrigue found in its redundant tools and relics. Scratches, scribbles and signs of wear and tear guide Gouldson’s mark-making on rich metallic plates. Altogether there are 100 works on show, Edinburgh Printmakers’ two modest gallery rooms are almost overwhelmed with ideas, stories and intimate glimpses into the past. 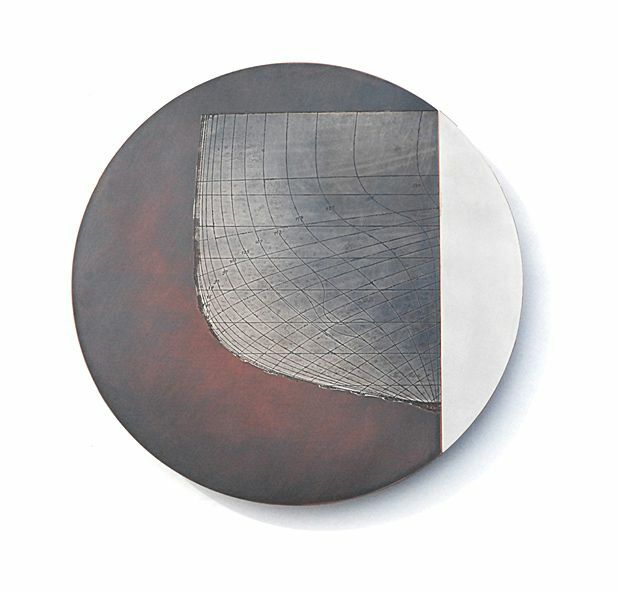 Templates used by a family of North Yorkshire tinsmiths inspire the overlapping metal plates that open the show, heavily bolted on to the wall as relief sculptures. These layered compositions scroll across the gallery like an ancient script. Originally on cardboard, the tinsmith’s scribbled notes and scraps of packaging now decorate hardened material, giving them the permanence that was absent in their previous form. Ephemeral scrawls appear again in the metallic tondos of the series ‘Lloyd’s Rules’, accompanied by fading fragments of images from old shipbuilding manuals, charts and maps. The exhibition touches briefly on Edinburgh’s own industrial skylines, with familiar images of Leith’s waterfront transferred on to etching plates. Most of the works in the exhibition have been made this year, and while that timeframe is not necessarily a feat in printmaking, Gouldson’s case is a little different. Works on paper are in a minority in Industrial Shift; the artist’s interests are best served when she presents the plate as an original work. Printmakers usually destroy the printing plate to preserve the integrity of the later edition, but in this exhibition Gouldson reverses the process. Visions of scarred architectural facades, outdated machinery and tools are presented on oxidised metal plates as blemished as the visual material they carry – and as worthy of preserving. Edinburgh Printmakers, until 24 May. Etched metal works influenced by historic industrial processes. Metalsmith Rebecca Gouldson discusses the work in her exhibition The Industrial Shift. Booking is essential.